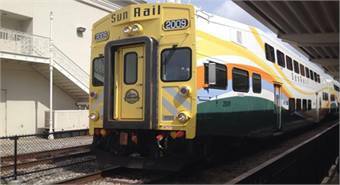 The Florida Department of Transportation (FDOT) opened the first phase of its SunRail commuter line on Wednesday. The line will significantly expand transit options and connect thousands of residents to jobs and other economic opportunities throughout Central Florida. The first phase of the 32-mile commuter rail line will connect residents of Volusia, Seminole and Orange Counties with downtown Orlando, providing easy access to thousands of jobs in the city’s downtown business district, many within walking distance of the line’s 12 new rail stations. The line will also link to Amtrak and LYNX bus service in downtown Orlando, improving transfers to LYMMO — the free bus rapid transit system that recently expanded service — and to other buses that serve greater Orlando. Construction of the rail line has created thousands of jobs, according to FDOT. The project has also spurred a $250 million public-private investment in a 176-acre Health Village at Florida Hospital where a new SunRail station will enable thousands of medical researchers, hospital employees, patients and their families to take transit to work or obtain medical care. Across the entire rail line, more than two dozen retail, office, government, and residential development projects within a 10-minute walk of new SunRail stations are planned or underway – representing about $1.6 billion in public and private investments altogether. The Federal Transit Administration (FTA) provided $178.6 million toward construction of the initial segment through its Capital Investment (New Starts) Grant Program. The line is considered the first phase of what is expected to be a 61-mile commuter rail line. In March, FTA announced that President Obama’s Fiscal Year 2015 budget includes a recommendation to provide additional funding to extend the line 17.2 miles south into Osceola County.